Condor's latest software update 3.3.0 has now been released to all of our users. Read on to learn more about our new features and improvements. During a scan, press the "On / Off" button on the handpiece to pause or resume the acquisition. You will have the possibility to rotate your right 3D-model. 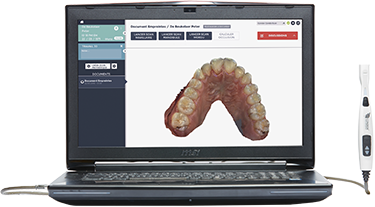 To finish an acquisitition and start the 3D model reconstruction, it will be necessary to click on the button "end scan", or do a long push on the top button of the handpiece. Margin lines available in the occlusion landmark for download.